When you think of tone shaping, a couple of items might come to mind. We all use pickups, capacitors (tone caps), and pots as tone shapers. All the above are powerful in their ability to shape how your guitar acts. Some people don’t understand the potential of one of our most important tools: Resistors. Imagine a pipe with free-flowing water in it. Then, imagine the water has to go through a much smaller gauge pipe where the flow is being “resisted.” This is similar to how a resistor works: it creates a higher point of resistance in the flow of electricity. I’m sure you’re thinking “Cool. But, how does that translate to my guitar?” We’re glad you asked! Today, we’re going to illustrate some basic examples of how resistors can shape your tone. One of the most basic uses of a resistor is in our Partial Tap Kit. The Partial Split Resistor gives low-output humbuckers a stronger single-coil tone when split. This is a common problem when splitting your humbucker – not all humbuckers are equal. Removing one coil from a lower-output humbucker, like our Pure P.A.F., leaves you with a weak-sounding single coil tone. Using a resistor can make all the difference. For an in-depth article on coil-splitting, head to our article here. Using a Partial Tap Resistor is easy. It takes the place of whatever you’re using to connect to ground. Instead of using a wire as your ground connection, use a resistor instead. Using one will give you a stronger coil tapped tone when you pull up. See below for an illustration to help you wire it up. Simple. A Resistor is “Resisting” the flow of electricity, so, when you pull up, instead of sending 50% of the Humbucker to ground, it will only send, say, 33% of it. This allows you to have a stronger single coil tone when pulled up. Alright “faking out” seems a little vindictive. However, when you have a Telecaster with a Humbucker in the Neck and a Single Coil in the bridge, it can be tough to make those two pickups play nicely together (read our in-depth article on this topic here). Let’s set the stage: You have a Telecaster with a Humbucker in the neck and a Single Coil in the Bridge. The Humbucker needs a 500K pot to sound good, and the Single Coil needs a 250K pot to sound good. You only have one volume pot – how can you compromise? Put a Resistor From The Bridge Pickup Hot To Ground. As you see, if you put a 500K resistor in Parallel with a 500K pot, the Bridge Pickup will “see” a 250K pot. This is great for your Telecaster as it you’ll have a great sounding Neck Humbucker and a perfect-sounding Bridge Single Coil. 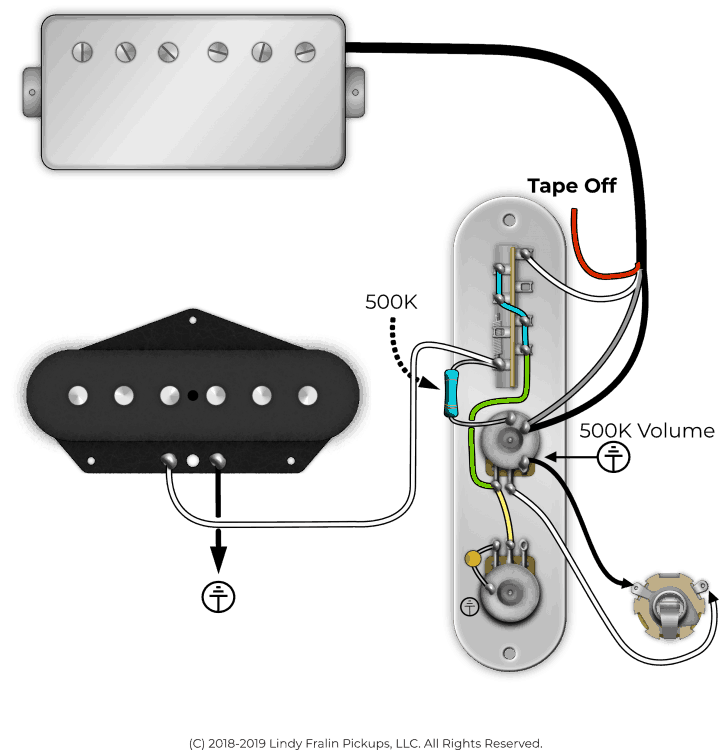 The above formula works perfectly when you’re on your Neck pickup and Bridge Pickup only. However, when you get in the Middle Position, you’re adding yet another resistor. Your Neck Pickup (500K) Your Bridge Pickup (500K) and the Parallel Resistor (~470K). When you combine your neck and bridge using this resistor trick, the middle position will see a 163K pot, making it darker than usual. In the above image, you have a 470K resistor in Parallel with your Volume Pot. 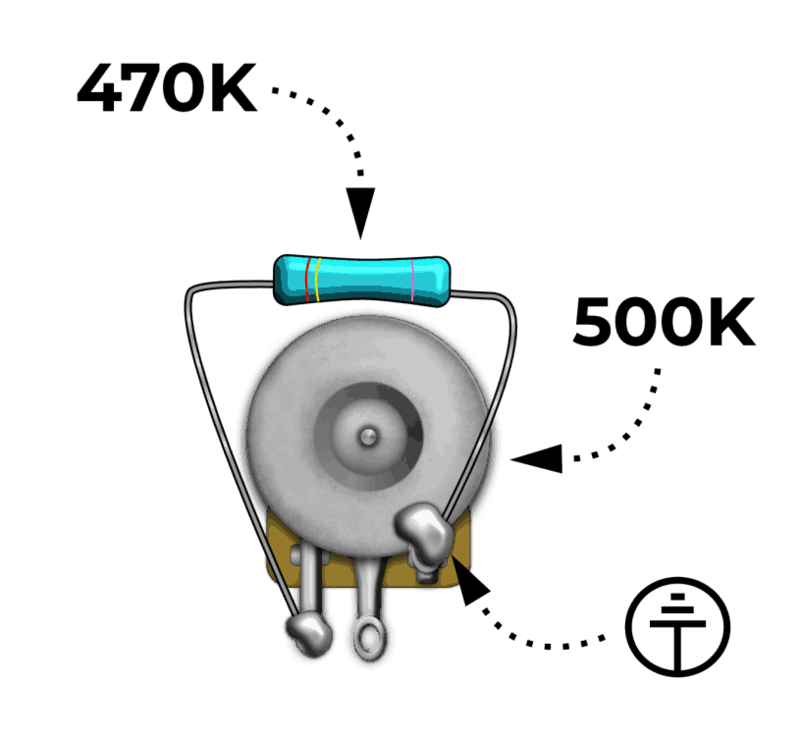 The pot value’s resistance is 500K, and your Resistor is 470K – with a combined resistance of 242K. Pretty neat! You can use this trick to take a bit of high-end off of your pots as well. Let’s say you have a 500K pot, and your pickups are just a little too bright on them: you can add a 1Meg resistor like the image above, and you’ve turned your 500K pot into a 333K pot. This will tame some of the highs. Thank you for reading. 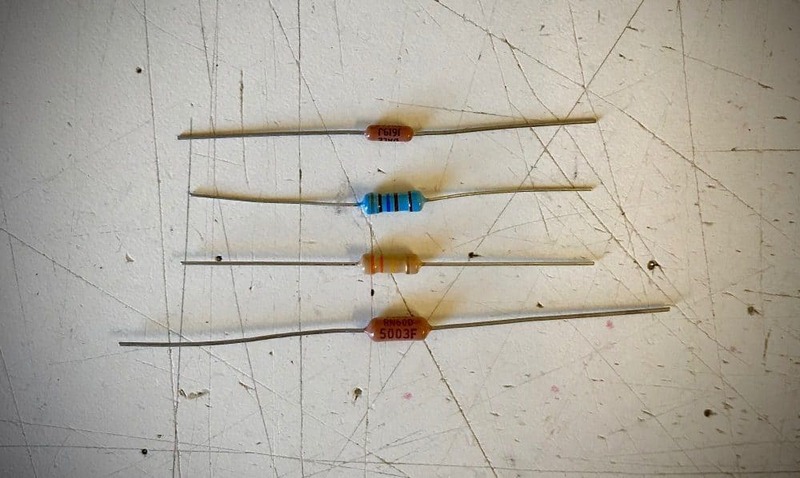 There are lots of great articles out there to learn how resistors work, and what they are used for. 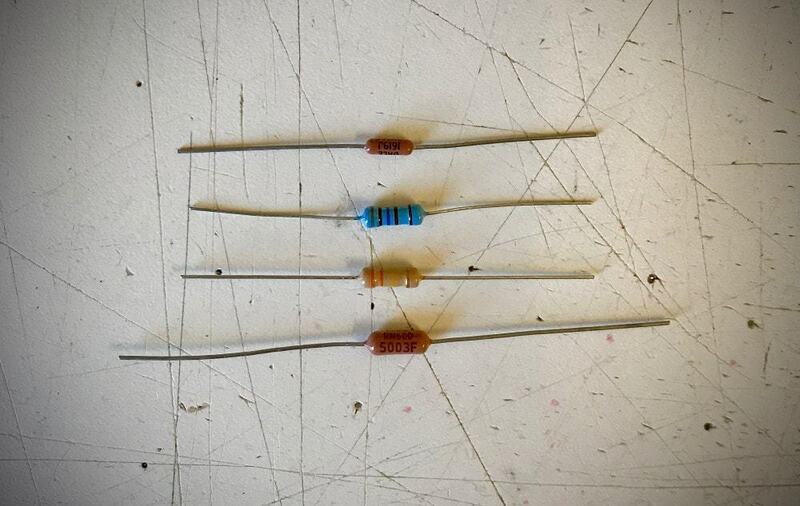 There is a multitude of ways to add a resistor to your guitar’s kit. How do you do it? Can you tell me where I can find a Wiring Diagram that shows me how to hook the blending pot up to a Fender Stratocaster? I can’t find it on your website. Great article, very useful explanations. Never thought of doing that on a coil tap or neck hum bucker/bridge single coil…I just encountered a Tele where the neck was a single and bridge a mini hum (hot rails type)…would I put a resistor on the neck in this case? Problem was, the bridge was wayyyy louder than the neck. I don’t believe the resistor will help you there. This is an issue with pickup outputs – Hot Rails are a very loud and high output pickup. This is due to both coils wrapped around steel plates. The design of the pickup leads to a very strong signal. What would help you in this situation is finding two pickups that will match up in output a little better. don’t you mean a 1M (mega ohm) resistor ? Good catch! I was thinking in ohms, not Kohms. I’ll get that fixed today. Thank you. Thanks!I bought a pawn shop Esquire with 500K pot and its just too bright. Now I know what to do.